Soil depletion, water pollution and water scarcity threaten UK food production. Much of our most productive farmland is in decline; it is projected that some of the Fens could become uneconomic to farm within a generation. We know that profitable farming can coexist with healthy soils and water. But how can we maintain food production and boost ecosystem services across the country as a whole? • Which farming systems could best overcome the perceived trade-offs between food production and the environment? • Could selling ecosystem services help farmers turn a profit by changing their cropping and livestock systems? • Is catchment-level collaboration the answer to the sustainable management of natural capital? 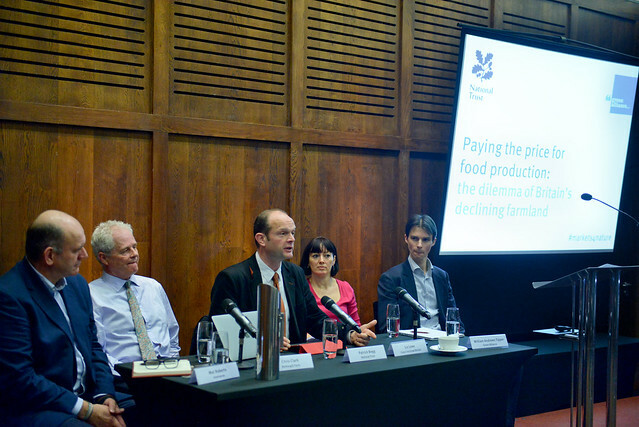 What would it take to get farmers, food businesses and water companies working more closely together? The debate also discussed the findings of a new report, Protecting our assets: using Natural Infrastructure Schemes to support sustainable agriculture, by Green Alliance and National Trust, featuring analysis on further applications of the Natural Infrastructure Schemes concept. See the Wakelet and the photos taken at the event.